GENOA – Global Ecovillage Network Oceania & Asia – is a network of people, ecovillages and organisations in Oceania & Asia. GENOA promotes Ecovillage living where people live together in a sustainable way, with dignity, in harmony with each other and with nature. It was established in 1997 by Max Lindegar of Crystal Waters Ecovillage in Australia. We envision a committed and cooperative community of concerned individuals and organizations, who share their knowledge, experience and wisdom for the creation of ecovillage communities all over the Oceania & Asia region; communities where people live together in a sustainable way, with dignity, in harmony with each other and with nature. 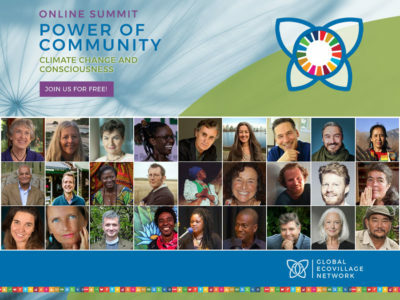 Connecting international and national Ecovillage networks including intentional and spiritual communities and townships; ecological, faith-based and government initiatives and networks; indigenous, and traditional villages and networks. Sharing information, learning, experiences and wisdom relevant to the region. Promoting traditional villages, ecovillages and innovative settlements, projects and networks that bring forth insights and actions that support healing, self-empowerment, regeneration, restoration and sustainability. Supporting individuals, communities, villages, organisations, governments and networks to create, transition and maintain holistic sustainable living through trainings, consultancies, convergences and bridging resources as needed. Within GENOA, ecovillage refers to intentional communities, indigenous and traditional villages, spiritual communities, and urban neighbourhoods and communities. There are many networks, organisations, government agencies and alliances within the GENOA network who help support the development of ecovillages in our region, and in integrating ecovillage concepts into a wider community. The network of established and forming ecovillages and related organizations, networks, and people in the Asia and Oceania region. Those who hold insight into and knowledge of the region, including mature ecovillage communities and networks, as well as ambassadors who actively promote the concept of ecovillage through their work, and elders who have had long-term involvement with ecovillage communities and projects. GENOA Network Support Organisation is an organization dedicated to enabling other communities to network, collaborate, and share insight, increasing the presence and awareness of ecovillage philosophy and practice in Asia and Oceania. It is run with financial support from and collaboration with GEN International, and through volunteer time.